Acknowledge the need for careful transitions in scale, vehicular circulation, and design between existing residential neighborhoods and new development. But Harvard seems to have pretty much disregarded all of these ideas in its current proposal. This is most obvious to the east of Windom Street, the largest area where Harvard's campus proposed by its impending IMP and existing homes will be side-by-side. I have trouble understanding why it would be a great idea to dwarf the existing homes by building graduate student dormitories for several hundred students right behind the one and two family homes there today. The home-made image below shouldn't be taken literally (or any more literally than Harvard's image), but it is another way to think about how a row of homes for Harvard affiliates might be used to go from community to campus. 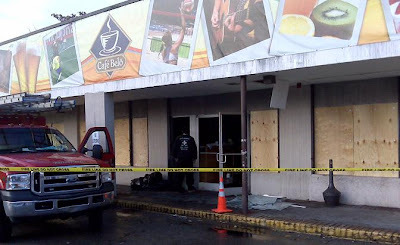 An early morning fire caused $350,000 in damage to Cafe Belo in Allston, officials said. The two-alarm fire at 181 Brighton Ave. started around 4 a.m. in the kitchen ceiling, Boston Fire Department spokesperson Steve MacDonald said. It took firefighters about 4 hours to put out the blaze at the one-story building. MacDonald said there were no injuries, and the cause of the fire is under investigation. The Boston Civic Design Commission meets on Tuesday, December 2 in the BRA Board Room on the 9th floor of City Hall. There will be a report from Design Committee on the Boston College IMP from 5:40 - 6:00. There is some provocative thinking about the future of Barry's Corner happening here - Harvard Square in Allston? - archBOSTON.org. The post by ablarc to start the conversation is one of the best on-line posts about local urban planning that I have read in a long time. It was a refreshing change at last nights Harvard Allston Task Force meeting to have Harvard planners, BRA planners and managers, and Allston residents actually sitting at the same table and talking about some of the issues with Harvard's campus plan as it relates to our neighborhood. It is a forum I hope we will be part of much more often because it is much more conducive to real discussion and understanding than being given a presentation of previously prepared information. How this might lead to consensus on a plan is less clear. We might start doing some joint problem solving and brainstorming or, what I sometimes thought I heard last night, was that the BRA and Harvard will instead try to do a more convincing sales job using the plans that they already have. Hopefully it will be the former. Specifically we discussed the Stadium Way proposal and the graduate student dormitories and other new buildings (shown in brown) that Harvard has proposed for between Stadium Way and the existing homes on Hopedale and Windom Streets (shown in gray). I don't dispute Harvard's need for new housing of this style, but I am not convinced that location is the best one for all parties. For example, putting it closer to Barry's Corner would seem to be just as good for its residents, do more to animate Barry's Corner, and would allow for housing or institutional uses abutting the existing homes. Harvard has precedent in Cambridge for successful building along the residential edge of its campus. 60 Oxford St, which also faces Hammond St, is shown in the photo below. Harvard Magazine described this building and the process that led to its design as follows. At 60 Oxford Street, north of the science complex, the firm of Perry Dean Rogers has designed a new structure to house University Information Systems and the Division of Engineering and Applied Sciences. Patient groundwork, which included voluntary zoning commitments by Harvard, led to productive meetings between a neighbors’ working group and architects Martha Pilgreen, M. Arch. ’80, Ned Collier, and Richard Jones, M.Arch. ’96. The early consultations led to acceptance of a very contemporary design, says Spiegelman. On one side of the site lies a residential neighborhood; on another stands the gleaming white Yamasaki-designed engineering sciences building, relating to little around it. Across Oxford Street, along the west-facing façade, looms a large brick building belonging to Lesley College. Sixty Oxford Street steps down in height from four stories to one as it moves toward the residential neighborhood; leaves space for Palfrey House, a Greek Revival building which will be relocated to Hammond Street at a future date; steps back from Oxford Street to mitigate the impact of its height; uses a warm limestone that softens the whiteness of the Yamasaki building and the darkness of the brick structures across Oxford Street; and incorporates a roof garden that gives a "soft top" to the lower end of the building while screening the Hammond Street neighborhood from the mass of the Lesley College building. A similar approach in Allston would yield a very different result than what has been proposed to date, and would likely receive a much more positive response. How mant people in the Allston community has she ever met? Has she ever spoken with the negative people she mentions or attended a community meeting? A short walk from the Ed Portal into Allston past some of Harvard's vacant buildings might explain to her why more than a "few" people are less than thrilled with Harvard's impact on Allston over the past several years. There was some construction last week at Brighton Mills. 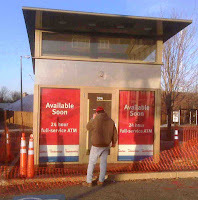 The Bank of America ATM is relocating from the west side of the shopping center where it has been for several years. Now it has its own freestanding building closer to Everett St. So this side of the shopping center, that once was home to Kmart, OfficeMax, and the ATM has now been completely emptied. 236 North Beacon Street - Change the legal occupancy from a rental truck center, rental and sales of trucks, accessory storage to a CVS retail store with a pharmacy and drive-thru window. Harvard profs - "Lets slow down Allston"
No decisions have been made, but facing a possible $200 million deficit, the Faculty of Arts and Sciences at Harvard (the largest division of the University which includes the undergraduate college, athletics, Graduate School of Arts and Sciences, and School of Engineering and Applied Sciences) is questioning the pace of Harvard's expansion into Allston. "Professors repeatedly cited the timing of the University’s ambitious plans for expansion into Allston as an area ripe for cutbacks. History of Art and Architecture professor Jeffrey F. Hamburger suggested that pushing the Allston project back could protect more immediate academic priorities, comparing such a slowdown to “providing major surgery in one area, preventing us from having to bleed the whole body.”"
"A pickup truck went off Soldiers Field Road into the Charles River when the driver sneezed, the state Department of Recreation and Conservation said. The accident happened near North Harvard Street in Allston shortly before 2 p.m. The truck was submerged, but the driver, Andrew Hansom, 42, of Weymouth, got himself out and swam to shore, State Police said.Hansom was taken to a hospital as a precaution but appeared to be unhurt, State Police said." El Cafetal, 479 Cambridge St. Request to extend hours of operation. 379 Cambridge St. Request for billiard license. 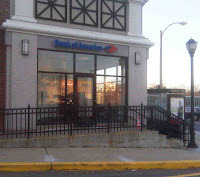 Check cashing operation, Brighton Ave. The meeting is at the Honan Allston Library, 300 North Harvard St. at 6:30P.M. Its hard to imagine why someone would be crossing Soldiers Field Road near Everett St at 3:00 in the morning to explain this horrible event. We needed our host city to be a place that attracted students and faculty, as it does today. We squeezed the budget pretty hard... in order to make room for... the investments we made in New Haven, starting with the homebuyer program [which subsidizes mortgages for Yale employees buying homes in New Haven]. We also made it a priority to reach out to the city of New Haven. The deans and directors at Yale all got the message that their programs had to have a local outreach component. Here are two recent examples of how Yale makes this local outreach real. The latest home built in the Jim Vlock First-Year Building Project, a wheelchair-accessible duplex for a disabled female veteran, was dedicated on September 25. The Building Project began in 1967 and is a requirement for every architecture student at Yale. This year the students worked with Common Ground Community, a nonprofit developer, as well as the Veterans Affairs Office to build the home in a low-income New Haven neighborhood. The design incorporated sustainable materials, including cedar and bamboo, and energy-efficient materials and technology, such as a precast concrete foundation system. Just a few hours into orientation, students of the Class of 2010 were launched into a two-day exercise called the Audubon Street Project, designed to introduce them to each other and to the SOM approach to solving business problems. Divided into groups of six or seven, each team had to devise a hypothetical business concept for an unoccupied storefront on New Haven's Audubon Street, near the SOM campus. Students were given background information -- maps, photographs, information about tax rates and other fixed costs -- but little more. The concepts had to be economically viable; have a social impact that reflected SOM's mission of educating leaders for business and society; and reflect Yale's desire to have a positive impact on the New Haven community. Gardner Pilot Academy at 30 Athol Street will be hosting 3 open house events as part of the Boston Public School's school preview time. Come see how Gardner Pilot Academy can help your child achieve academic excellence through its innovative programs and partnerships. Gardner Pilot Academy cares for children from 7:30 am to 6:00 pm with regular school hours between 8:30 am- 2:30pm. Is located in the North Zone, 50% of the school's student capacity is reserved for families living within 1 mile of the school. 71% of GPA's students live in the Allston/Brighton community. GPA strives to keep a low school wide student to adult ratio and to maintain on average classes sizes of about 20 students per classroom. GPA boosts a school wide ratio of one adult for every ten students. Has an active and involved Governing Board and Parent School Council. I wonder how much more cut-through traffic this will bring to A/B as drivers seek ways to save a few bucks and avoid the Pike. There are already several comments on Boston.com suggesting how people will change their travel routes. Ironically, considering all the concern about "sustainability", moving people from a road where they can drive at a relatively constant speed (and get "highway" mileage) onto local roads where they will do more stop & go driving (and get lower "city" mileage) is a pretty wasteful thing for the State to encourage. The Turnpike Authority board voted 4-1 to approve a hike of 75 cents at the Weston and Allston-Brighton tollbooths and $3.50 at the Sumner and Ted Williams tunnels. The plan, which is subject to public hearings and a final vote, would take effect Feb. 9. It would increase tolls at Weston and Allston-Brighton to $2 from $1.25 and at the tunnels to $7 from $3.50. Fast Lane users would pay $1.50 at Weston and Allston-Brighton and $6 at the tunnels. Mary Ann's and Big City will be closed for failure to comply with the Fire Safety Act of 2004 unless new sprinklers are installed today. The law requires entertainment venues with capacities greater than 100 people to install sprinklers by Nov. 15, 2007. The law allowed local fire officials to grant one-year extensions on the deadline. The presentation, titled "NABCWP Urban Design 111208 FINAL.pptx (PowerPoint 2007)", from last night's meeting is online at the CWP website. Beware: It is a 47MB file and you will need the Microsoft Viewer if you don't have PowerPoint 2007 installed. The first part of this interview talk about the history of Fredrick Law Olmsted, urban parks in America, and the need for islands of greenery and tranquility in the midst of urban life. There are many different kinds of parks. A common problem is the lack of vocabulary to describe these types. Words like "green space" and "open space" are too vague and we should better understand the lexicon of urban design. What do we want and what is its formal name? Figure it out so we can ask for it by name. These requests are much more meaningful than asking for "green space" and "open space". Veteran's Day pushes it back this week. In a large room of people it is impossible to have any kind of meaningful discussion about so much information. Also, Tom Lally asked an important question about how this planning relates to Charlesview, and Lenny Kelliher asked "When? ", noting that we have been looking at drawings like these for years and it is time to start developing a 2 year plan, a 5 year plan, etc. not just generally talk about something that might happen a decade or two (or 3 or 4) from now. Science Complex construction to slow? Faust hinted that the University may need to cut costs and push back timelines for certain initiatives, such as expansion plans in Allston. Though construction for the first science building in Allston, which began this spring, was slated to near completion in July 2011, it is unclear whether this date will be postponed as the University assesses current spending. In December of 2007 Harvard President Drew Faust strongly refuted a Boston Globe story that Harvard was "rethinking" its plans for its Allston expansion. At the time, she told WBZ radio that "there is no way in which we are slowing down". A construction slow-down in Allston is really the last thing that Allston needs. We need Harvard to build, not just anything and certainly not a campus physically, socially, or economically isolated from the rest of Allston. The "no-build" scenario that leaves Allston what we have had for the last decade - Harvard's unattractive, empty, and under-utilized buildings throughout our neighborhood - is hopefully one that will not continue to be our reality for much longer. According to the plan, tolls likely will be raised inside Route 128 to pay off debt associated with Big Dig. Toll booths outside Route 128 will be eliminated, except in West Stockbridge near the New York border and in Sturbridge, close to the Connecticut border. Sounds like a great man. We could use more people like him supporting our attempts to have discussions with Harvard, BC, and the BRA. A corporation that moves into a town is just as much a resident as the family down the street, Edmund M. Burke believed, and if the business wants to do well, it should become what he called a "neighbor of choice." "A company must also demonstrate its concern for the environment and to the communities where it is based. People expect them to be more responsible." Along with the permits and municipal approvals that companies collect to build their factories and office buildings, they also must obtain a metaphoric "license to operate," Dr. Burke wrote in publications such as his 1999 book "Corporate Community Relations: The Principle of the Neighbor of Choice," which became a text of choice for many students and businesses. The "license to operate," he wrote, might include company workers participating in community events and fund-raisers. Interaction between workers and neighbors, he said, builds a kind of trust that was absent in years past, when a corporation might simply write a check once a year and donate to a local charity. Dr. Burke drew inspiration for many theories from growing up in Allston. Ed believed strongly in social justice - in his younger days, rather vocally," said his wife, Lee. When is a lobby more than just a lobby? 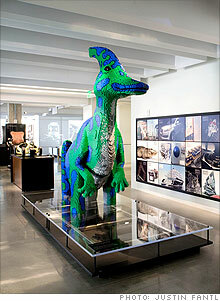 Autodesk, my employer, has recently unveiled a new lobby/museum in a San Francisco office building. Fortune magazine, in this story and this video, features the $10 million Autodesk Gallery and describes it as an "awesome how-things-are-made museum". What does this have to do with Allston? Last year Harvard touted the 6,800 sq ft atrium in its Science Complex as one of the major public spaces in the 4-building complex. The opportunity to walk through Harvard's atrium didn't strike me as all that impressive, but maybe Harvard will surprise us and make a space at least as awesome as what Autodesk has built. Thomas Friedman, in his Wednesday column, interviewed Harvard University political philosopher Michael Sandel. Professor Sandel, who teaches Harvard students about justice and moral reasoning, claims that in Tuesday's election "the American public rejected these narrow notions of the common good." A student of Sandel's explains that, "His aim was to expose to the students the extent to which these abstract philosophical questions really are relevant in our daily lives." Abstract ideas like justice deserve to be applied to how Harvard's expansion in Allston and its track record over the past 10+ years. "We've always been at our best when we've had leadership that called upon us to look past our differences, to come together. Leadership that rallies us to a common purpose, a higher purpose... when we recognize the common stake we have in each other... together we cannot fail." Harvard's plans in Allston embody a narrow and outdated notion what a campus and community can be. Harvard draws a line on a map and shows little interest in life on the "wrong side" of that line. "We are just building our campus" and "We are doing what the zoning code require us to do" they say. Harvard is been in Allston for 105 years. What would it do differently if it considered itself a citizen of Allston? The BRA has published a summary of issues that heard in response to Harvard’s recent IMP presentations. I think it is a good start and also needs much more breadth and depth. You can download it at the ABNNF website and it would be great to hear your comments here or via email to ABNNF@googlegroups.com. Paul Berkeley, president of the Allston Civic Association, and Pami Singh, co-owner of Punjab Palace on Brighton Ave, talk with WBUR about liquor licenses. If you have a problem voting, call the Lawyers Committee for Civil Rights Hotline: 1-866-OUR-VOTE. If you live in Boston, and need a ride to the polls, call MassVOTE at 617-542-8683. The New York Times has a feature story on Collingswood, NJ, a town near Camden and Philadelphia whose renaissance offers a possible model for what A/B North might become. Collingswood is a bit bigger than A/B North (1.6 square miles vs. 1 square mile) and its population of 15,000 is probably comparable to what the A/B North population will be after the Holton St Corridor, Western Ave, and the new Harvard campus are developed. In the late 90's Collingswood was “the place you would go to buy drugs” but now it has transformed into a community with many positive attributes and things that would be welcome here. Public transportation that takes only 11 minutes to travel 7 miles into downtown Philadelphia. If a New Jersey suburb can support this constructive development and enhance the quality of life for its residents, it seems reasonable to expect the development of Harvard's campus and the rest of the community (Western Ave, Holton St Corridor) to be able to do something at least as good.